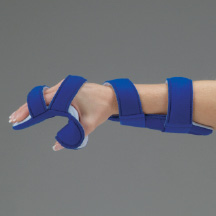 LARGEST SELECTION of discounted Resting Hand Wrist Splint, Hand Splint, Hand Immobilizers, and Resting Hand Braces. LOWEST SHIPPING COST GUARANTEED. Very pleased with the service I received. I have arthritis in both hands & clutch my hands at night making it very painful & keeping me awake at nights. It was recommended to try splints for my hands, I've only used them for 4 nights & already see a difference, sleeping better & much relief in pain & movement in the morning. I'm using them for both hands. I researched before buying & found this to offer the best price for my money, very happy with my purchase. I love this brace. This style/name brand was recommended by my OT. Your price was half of other websites. Ordering process very easy and I received a confirmation right away. It arrived in just a few business days. This brace has greatly helped and is very comfortable. I even sleep with it on. 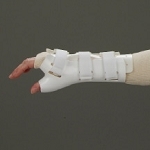 Good night time splint for mild spasticity. Although measurements are given on this site, had to look up where to measure my hand on another site. It fits and thumb stays in place.